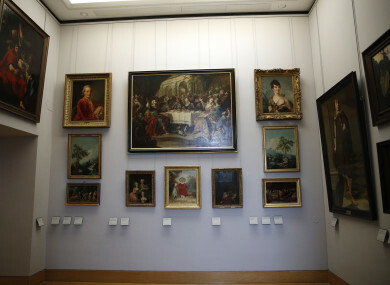 FILE: Paintings looted by Nazis during World War II, are on display at the Louvre museum, in Paris. In a move aimed at returning work of art looted by Nazis during World War II, the Louvre museum has opened two showrooms with 31 paintings on display which can be claimed by their legitimate owners. FRANCE HAS RETURNED three paintings by the Flemish master Joachim Patinir to the descendants of a Jewish family who were forced to sell them as they fled the Nazis. The Bromberg family fled to Paris from Germany in late 1938 and were forced to sell the 16th-century Triptych of the Crucifixion depicting Christ on the cross the following year, along with several other paintings so they could get to the United States via Switzerland. The paintings were formally handed over to the descendants of Herta and Henry Bromberg at the Louvre Museum by French Culture Minister Francoise Nyssen. It is the second time in two years that the French state has returned despoiled art to the family. In 2016 it handed over another 16th-century painting, Portrait of a Man, by one of the followers of Antwerp artist Joos van Cleve. The Patinir paintings had languished for nearly seven decades unclaimed in the French state collections after they were recovered in Munich after World War II. The triptych had been bought at a knock-down price after the German occupation of Paris and was destined for Hitler’s Fuhrermuseum in his home town of Linz in Austria, where he wanted to build “the ideal museum”. Patinir is regarded as the father of landscape painting, and developed the panoramic style that became a hallmark of the northern Renaissance. More than 30 looted paintings have been put on display at the Louvre since December to raise public awareness of the issue. France has stepped up its efforts to returned art looted during World War II to its rightful owners, using geneological experts to trace families. “It is no longer acceptable to wait for descendants to turn up and ask for the restitution of their family’s art for them to be given their due,” said former culture minister Audrey Azoulay, who now heads UNESCO. It is thought that up to 100,000 works of art, and millions of books, were stolen from French Jews or Jews who had fled to France before the German occupation. The Allies found around 60,000 of the missing artworks after the war, and France has been returning works to families since the 1960s — although only 30 were given back up to 1994. Since then there has been a more concerted effort with a commission of experts, historians and archivists dedicated to resolving the problem since 2013. Email “France hands back Nazi looted art to Jewish family”. Feedback on “France hands back Nazi looted art to Jewish family”.